Vital Records of Marblehead, Massachusetts to the end of the year 1849, Salem, Mass. : The Essex Institute, (1903) , Vol. 1, p. 319. Marblehead Historical Society, Old Marblehead sea captains and the ships in which they sailed, , at https://books.google.com/books?id=GxIhAAAAMAAJ . Marblehead, Mass. : Benj. J. Lindsey, (1915) , p. 87. Vital Records of Marblehead, Massachusetts to the end of the year 1849, Salem, Mass. : The Essex Institute, (1903) , Vol. 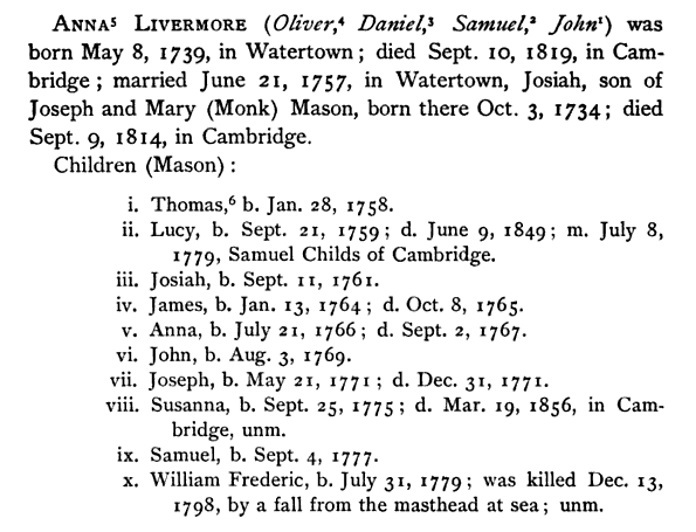 1, p. 320.
living at Ward 2, Portland, Cumberland County, Maine. Church of Jesus Christ of Latter-day Saints. Manti Temple, IGI reference to Endowments for the dead, 1888-1970; name indexes, 1888-1906; heir indexes, 1906-1959, 1970-1972; baptisms for the dead, 1943-1970, Salt Lake City: Filmed by the Genealogical Society of Utah, (1957-1971) , Film Number: 453731 Reference number: 29070. Vital Records of Marblehead, Massachusetts to the end of the year 1849, Salem, Mass. : The Essex Institute, (1903) , Vol. 2, p. 263. 1920 United States. Bureau of the Census. 14th census, 1920 population census schedules, Washington, District of Columbia: The National Archives, ([193-?]) , Census Place: Everett Ward 3, Middlesex, Massachusetts; Roll: T625_709; Page: 3B; Enumeration District: 133; Image: 995. Social Security Death Index, at http://www.ancestry.com/ssdi/advanced.htm, Number: 022-28-2386; Issue State: Massachusetts; Issue Date: 1953-1954. Frederick Walker Lincoln was born on June 12, 1796 in Boston, Massachusetts, son of Amos and Deborah (Revere) Lincoln. She and Oliver Hale Jr. published their marriage intention on September 26, 1854 in Portland, Cumberland County, Maine. "United States Census, 1940," database with images, FamilySearch (https://familysearch.org/pal:/MM9.3.1/TH-1942-27894-21594-98?cc=2000219 : accessed 5 September 2016), Maine > Penobscot > Lincoln Town > 10-84 Lincoln Town bounded by (N) Haynes Ct extended, Haynes Ct, Maine Central Railroad, Mattanawcook Pond, unnamed Brook, unnamed Brooklet, State Road 16; (E) Town Line; (S) Town Line; (W) Penobscot River; also Lincoln (part), South Lincoln > image 8 of 38; citing Sixteenth Census of the United States, 1940, NARA digital publication T627. Records of the Bureau of the Census, 1790 - 2007, RG 29. Washington, D.C.: National Archives and Records Administration, 2012. Find A Grave Memorial# 78700414.
living at 27 Fremont Street, Lowell, Massachusetts. Littlefield, Arthur C. (Eva M) shipper. house 27 Fremont. Littlefield, Arthur C. (Eva M) clerk Saco-Lowell Shops. house 27 Fremont. Littlefield, Arthur C. (Eva M) clerk. house 27 Fremont. 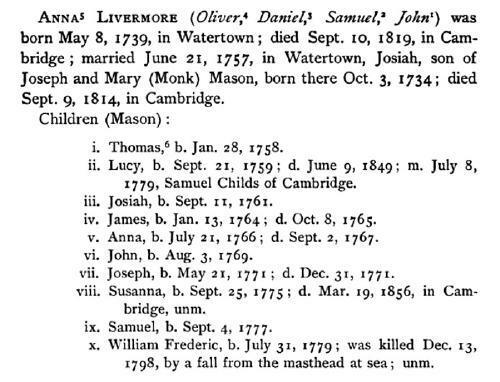 "Massachusetts, Marriages, 1841-1915," index and images, FamilySearch (https://familysearch.org/pal:/MM9.1.1/N48J-LQ2 : accessed 23 Nov 2012), Arthur C Littlefield and Eva M Skillings Farris, 1909. 1910 United States. Bureau of the Census. 13th census, 1910 population census schedules, Washington, District of Columbia: Bureau of Census Micro-Film Lab, ([19--?]) , Census Place: Lowell Ward 1, Middlesex, Massachusetts; Roll: T624_599; Page: 19B; Enumeration District: 0835; ; FHL microfilm: 1374612. 1920 United States. Bureau of the Census. 14th census, 1920 population census schedules, Washington, District of Columbia: The National Archives, ([193-?]) , Census Place: Lowell Ward 1, Middlesex, Massachusetts; Roll: T625_710; Page: 19A; Enumeration District: 180; Image: 841. The History of Waterford, Oxford County, Maine, , at http://books.google.com/books?id=Qwg1AAAAIAAJ . Portland, ME: Hoyt, Fogg, & Donham, (1879) , p. 259. 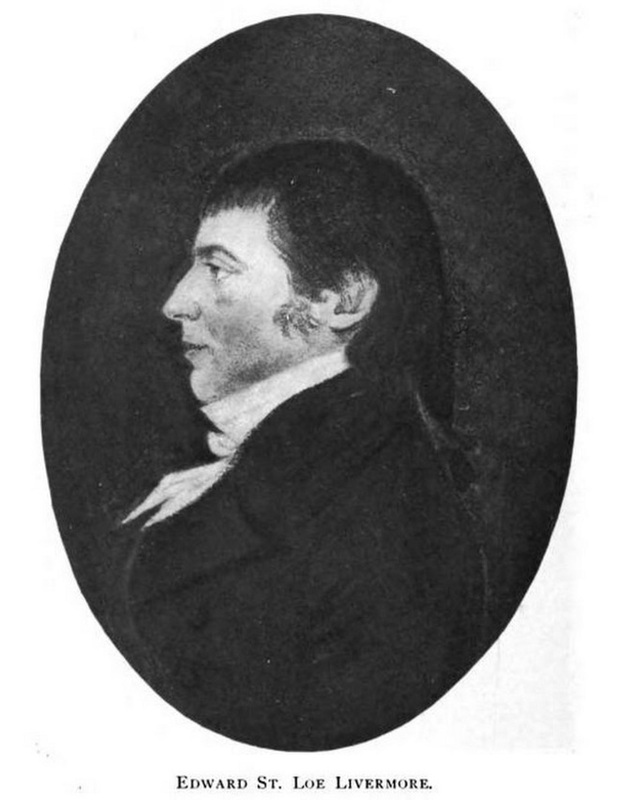 George Norbury Mackenzie, Colonial Families of the United States of America, Vol. 6, , at https://books.google.com/books?id=J1tlAAAAMAAJ . Baltimore, Maryland: The Seaforth Press, (1917) , p. 319. Walter Eliot Thwing, The Livermore Family of America, , at https://books.google.com/books?id=88xHAQAAMAAJ . Boston: W.B. Clarke Company, (1902) , pp. 144-6. Walter Eliot Thwing, The Livermore Family of America, , at https://books.google.com/books?id=88xHAQAAMAAJ . Boston: W.B. Clarke Company, (1902) , pp. 143-4.